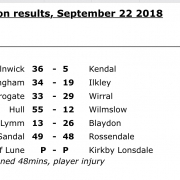 The Blaydon backs were in excellent form, particularly in an even first half, but up front it was a different story where the lack of bulk was a distinct disadvantage along with the issue of 3 yellow cards against the Crow Trees side. Man of the match Harry Davey landed an early penalty for Huddersfield, the fly-half finishing with a personal tally of 14 points, but it was the visitors who secured the opening try. Joel Matavasi and Dan Turland combined in a smart move to put winger Tom Gorman clear to score under the posts with Ryan foreman adding the conversion, but in rapid succession came two of the yellow cards. The home side were quick to capitalise, scoring first with a disputed penalty try and then No8 Dickie Piper from a forward drive, and finally a length of the field effort finished off by scrum-half Joel Hinchcliffe. 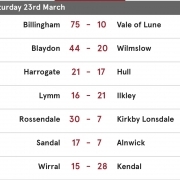 Leading 27-7 at the break Huddersfield continued where they had left off and added further scores through lock Adam Malthouse and winger Brendon Conway, and then with Blaydon on the back foot and under pressure were awarded another penalty try. 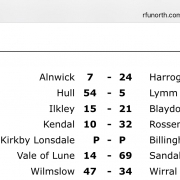 Going into the final quarter Blaydon were trailing 48-7 but now found themselves with a lot more ball and general possession and began a remarkable revival. Front row forward Cameron Bell crashed over in the corner from a spell of pressure but the conversion opportunity was turned down on the basis that a try bonus point was now the only possibility left available. Second-row Rob Lenderyou then went in near the posts but again with time running out the conversion was ignored, and the policy was fully justified 4 minutes from the end when skipper Keith Laughlin crossed from a catch and drive for try No4, the bonus point moving Blaydon one place up the table.